Like many other fairs, these events were fêted with numerous medals, not only officially sanctioned by the governing bodies but also privately produced unofficial souvenirs. 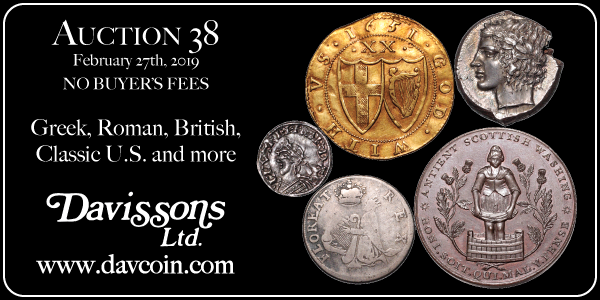 The so- called dollars of these fairs and expositions have long been popular among collectors especially since publication of the Hibler & Kappen catalog. However, Shevlin and Hyder take this investigation to the next level with this truly exhaustive and encyclopedic study. 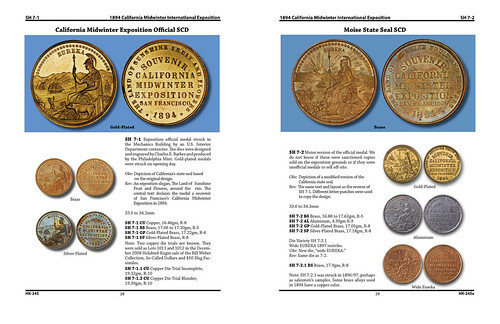 As a relative newcomer to so-called dollars, the attention paid to the history of the events behind the medals is always appreciated, especially with the not nearly as well-known expositions, such as the 1894 California Midwinter Exposition. Each exposition has its own chapter with a thorough historical overview as well as the numismatic background. Details on some of the die varieties of several medals are also provided, along with key identification markers. A personal interest of mine are the officially produced souvenir slugs from the 1915 PPIE. These medals resemble the $50 gold coins produced by the U.S. Assay Office of Gold, though this is often quite superficial. Seeing a detailed history and examination of these pieces is a welcome sight and helps to add context to the examples in my personal collection. The entries for each medal provide an overall history of each medal, obverse and reverse descriptions, the composition, diameters, weights, as well as a rarity scale running from R1 to R-8. Large and clear photographs of each medal are also provided, along with detailed enlargements for specific varieties where appropriate. The authors helpfully put not only their catalog numbers in the upper header but also the Hibler-Kappen concordance in the lower margin, an especially useful feature when trying to look up a specific so-called dollar. This also serves to highlight medals and varieties that are unlisted in the Hibler-Kappen book. The book is printed in full color throughout on thick paper stock and is profusely illustrated with not only images of the medals themselves but also historical photographs, postcards, and related ephemera. I have long believed that these additional illustrations, details, and artifacts help to provide a more rounded and complete picture and am always appreciative when authors include them. Here, Shevlin and Hyder put in just the right amount and serve to accentuate an already excellent presentation. 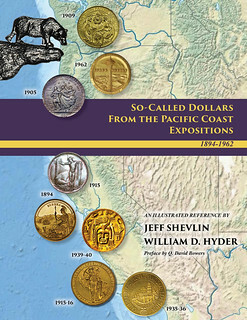 All in all, Shevlin and Hyder have produced an invaluable work for devotees of so-called dollars, as well as those with even a tangential interest in exposition medals. Eminently readable and useful, this is a book that will stand the test of time. The regular edition with a glossy sturdy binding is $59.95. For the bibliophile, a deluxe leather bound edition is also available for $149.95. Limited to 100 copies, this special version has a brass commemorative medal encased in the cover struck by Daniel Carr using an original die engraved by George Morgan for the 1909 Alaska-Yukon-Pacific Exposition. In addition to the main volume, there is also a pocket-sized price guide and checklist companion book available for $19.95 that will be produced annually and be expanded each year until all so-called dollars are included. Shipping is $4.50 per book. 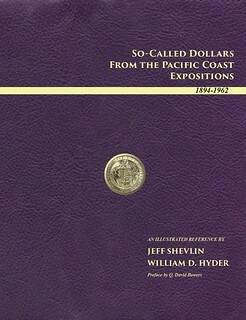 Both the regular and deluxe versions of So-Called Dollars from the Pacific Coast Expositions 1894-1962 and the pocket price guide may be ordered from Jeff Shevlin, 1894 E. William St., Suite 4-240, Carson City, NV 89701, phone: (916) 955-2569 or email: SoCalledGuy@Hotmail.com. For additional information, visit http://So-CalledDollar.com . I haven't seen the deluxe version and the embedded medal struck from an original die is a great idea - something for both the bibliophile and numismatist. We're living in a better world today - printing technology is light years ahead of the days when the original reference on So-Called dollars by Hibler and Kappen was published in 1963. This sumptuous work covers only the Pacific Coast expos, yet fills 278 pages to H-K's 156. The business model of producing a separate annually-updated pricing guide is a sound one. Without prices the book won't quickly go out of date and will remain the go-to resource for collectors. This was precisely the model in the 1960s - my library includes a separate pricing guide for the H-K book. The steadier annual income from the pricing guides will support the time-consuming research involved and hopefully allow the authors to work on bringing another book to the market. I wouldn't be surprised if this model were adopted to someday cover the full gamut of American medals. Each sub-area is deserving of the excellent treatment given by Shevlin and Hyder to the Pacific Coast medals. Now back to the book at hand. The color coding scheme enabled by cheap color printing is a useful tool - each of the six expos is asssigned a color used for the background of the photos. It's a good shorthand for grouping an otherwise unwieldy number of items. Other great features include the die pairing and attribution charts, and the visual guides to medal compositions and finishes. 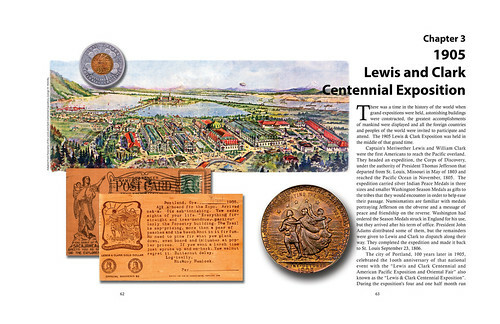 As a bibliophile I appreciate the images of advertisements and order forms for the Lewis & Clark medals, and as a student of hobby history I'm grateful for the inclusion of Appendix A on So-Called Dollar Fellowship Gathering Medals.